No album has given me more pleasure this year than Schönberg by the trio of Mateusz Kołakowski (piano), Alan Wykpisz (bass), and Bartłomiej Korelus (drums). Recorded in the middle of 2016 and released at its end, for the last four months it has played repeatedly in my headphones. I procrastinated writing this review, thinking eventually I’d be able to give these remarkable musicians their due. But mainly it was because once I write a review, I move on to other albums, other reviews. And I wasn’t ready for that. Schönberg is inspired by a set of solo piano works—Sechs kleine Klavierstücke (Six Little Piano Pieces), Op. 19—by the modernist composer of the Second Viennese School, Arnold Schönberg (1874-1951). Depending on the interpretation, these six little pieces, composed in 1911, take a little under six minutes to play—the longest is eighteen measures; the shortest, nine. 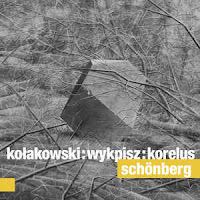 Kołakowski, Wykpisz, and Korelus transform Schönberg’s aphoristic scores into a forty-minute meditation on the nature of atonality and the flexibility of contrapuntal rhythm in the realm of improvisational jazz. Schönberg’s six little numbered pieces have no titles, but he provides hints indicating tempo. The first is “Leicht, zart” (light and delicate), the next “Langsam” (slow), “Sehr langsam” (very slow), “Rasch, aber leicht” (brisk, but light), “Etwas rasch” (somewhat brisk), and finally another “Sehr langsam” (very slow). Each of Schönberg’s short pieces provides the motif for the trio’s versions, but they do not follow the head/solo/head progression of traditional jazz. Nor do they engage in completely free improvisation. Instead, they follow a course akin to Schönberg’s theory of “developing variation”: their individual, improvised repetitions continually reshape the motif harmonically, melodically, rhythmically, or by intervals. In the third and fourth pieces, they take bold liberties. Schönberg’s third piece has the direction, “sehr langsam.” It seems an even slower version of the second piece—so slumberous, the composition almost suffers entropic disintegration. The trio utterly ignores Schönberg’s direction. Instead, Kołakowski, Wykpisz, and Korelus ramp up the tempo so their piece also almost seems to fly apart—only this time like a rocket travelling at too great a speed. They turn the longest piece for Schönberg (a glacial seventy-eight seconds!) into their shortest (three-and-a-half minutes). In a similarly playful mood, they turn Schönberg’s fourth piece—which comes in at around twenty-nine seconds—into their longest (a little over eleven minutes). The trio’s version begins with about two minutes of somber, elegant solo piano, but in third minute the song radically translates into New Orleans ragtime. By the song’s end, Kołakowski’s striding left hand and the band’s boogie-woogie playing grows meditative before sliding into slick hard-bop. Their combined version of V and VI begins with compelling arco bass. VI was written four months after I-V, following Gustav Mahler’s death. Schönberg considered it a tombeau. But there is nothing of the funereal in the trio’s version. A presto rhythm leads to a tinkling right hand and powerful chording with the left, providing romantic heft Schönberg always aimed to abandon. It is difficult to do justice to the virtuosity, the intellectual and historical reach, and the audacity of imagination of Mateusz Kołakowski, Alan Wykpisz, and Bartłomiej Korelus. The pianism of the former child prodigy Kołakowski reveals his extensive classical training. He combines baroque, classical, and Slavic avant-garde styles with the complicated chords and rhythms of both Schönberg and jazz, all while maintaining a sweet, bluesy touch. I have an inordinate fondness for crafty bassists, and Wykpisz does not disappoint. His solos in pieces I, II, and IV are marvels of percussive pizzicato and thunderous, atmospheric arco. When Kołakowski angles off into solos, Wykpisz sticks close to Schönberg, keeping the song anchored in the composer’s atonal melodies. The work Korelus does with cymbals, brushes, and rims is impeccable. They have made a terrific album. 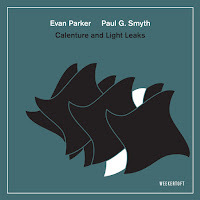 If your taste in free jazz trends toward the cerebral (but you’re secretly a sucker for some emotion), you will find great satisfaction in this album. It hits all the right notes, again and again. 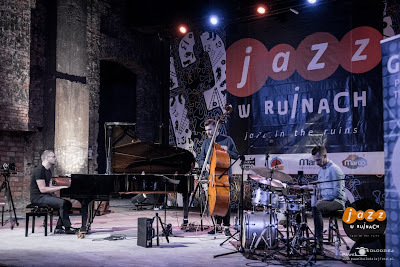 On August 11, 2017, a recording was made of the Kołakowski / Wykpisz / Korelus trio playing their album Schönberg live at Jazz w Ruinach (Jazz in the Ruins) in Gliwice, Poland. 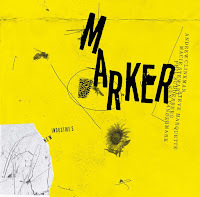 The trio has been playing their improvisations based on Schönberg’s “Six Little Piano Pieces” for a year or so, and this recording (release date and label TBA), showcases their unflagging pursuit of all the mysteries hidden away between the notes in those tiny scores. Maintaining their light-reined adherence to Schönberg’s originals, the trio’s improvisations take on a different timbre before an audience. 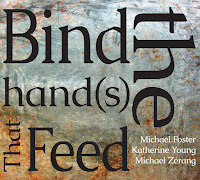 Perhaps the most fascinating contrast is how the trio stitches together several of the pieces, blending them via some mesmerizing contemplative reveries. Moments of deliberative pause stretch out on stage, with each musician seeming to find a new progression of notes that needs to be tried against the new ideas of the other two. Their care and patience is exquisite. What was sharp, fast, and angular about Kołakowski’s playing in the studio gets sharper, faster, and bewitchingly jagged live. 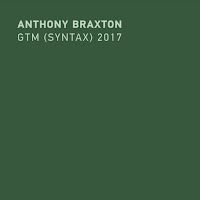 He attacks phrases, layers harmonics and arpeggios, and leaves us transfixed with ringing trills that suffuse the air with sound. Wykpisz’s power here is most evident in his restraint. Whereas Kołakowski’s chops have gotten evermore jazzy, Wykpisz’s style gets more “classical.” During his understated solos, he rubs short, rough pizzicato notes and bows poignant, lyrical chords. Korelus, too, gets his moments to shine, sussurating a solo on cymbals and kinetically brushed toms. Though often still tantalizingly sparse, the trio’s playing live unleashes powerful emotions pent up in Schönberg’s pensive score. The end of the set, a medley of Schönberg’s fifth and sixth pieces, arrives as an achievement, a joyous arrival after a challenging journey, a symphonic vista that is sight to behold. The encore is the trio’s version of Edvard Grieg’s “Watchman’s Song” (Op. 12 No. 3) (1867). 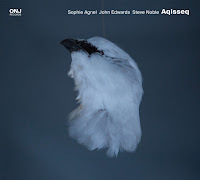 It has a bit of a high-school-recital, wedding-march Romantic-era vibe that doesn’t jibe well after the rabid modernity of Schönberg, but if the trio has set its sights on transforming Grieg’s Lyric Pieces into jazz, I’m looking forward to hearing what they will come up with. They are alchemists, and what they touch turns gold. The Six Little Piano Pieces do not employ serialism. The twelve-tone technique wasn’t invented by Schönberg until 1921, ten years later, and was first used by him in his Piano Suite, Op. 25. The confusion between atonality and serialism is quite common, and in my view, it would be difficult, if not impossible, to improvise using classical serialism. Bill Evans did write “Twelve Tone Tune”, but only the tune was serial. If you’re looking for a good recording of the Six Little Piano Pieces, if only by way of comparison with the present album, try the recordings of Schonberg’s complete piano music by Maurizio Pollini or Paul Jacobs (the latter is more difficult to find). If we're being technical, whereas it's true that Op.19 is "merely" atonal, what Schoenberg subsequently developed was dodecaphony, the "twelve tone technique." Serialism came later, and involves expanding that technique beyond the domain of pitch, into rhythm, dynamics, etc. Thanks for bringing this item to my attention. Actually, as long as I'm commenting, serialism per se aside (and opinions differ on who first developed that), when it comes to dodecaphonic improvisation, what one most often finds in jazz-influenced music is inspired by the style of Alban Berg. Namely, the tone row itself is constructed so as to move through harmonic regions (in a systematic manner, of course), and the resulting music does likewise. Something like the Berg Violin Concerto will not sound strange to people accustomed to contemporary free jazz. Best wishes to all. The goalposts have been moved since my original post. You're correct: "serialism" was not a term used by Schönberg, but the musical world has been using it since the 50s, so I don't see a problem with that. The extension to duration, rhythm etc. is what is known as "total serialism" and for obvious reasons, only lasted for a short period. Glad you fellas could get that sorted out, and nice to see that the man's ideas can still stir the pot--though the offending word was hardly the point of the review. Go listen to the record!